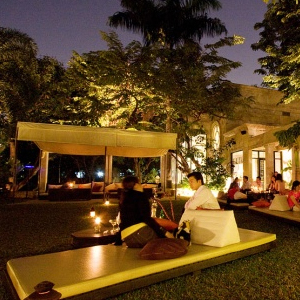 With a lantern-lit garden and plush tearoom, Al Majlis provides a spot of solitude in the residential area of Ekamai. The menu is straight forward Moroccan with some authentic dishes and some fusion ones (Meatball Tagine, Penne Arabian.) Not to be missed: Moroccan Mint Tea, Flavored Shisha, and a bite of Chocolate Fondant. From Ekamai BTS Station, take a taxi to Ekamai Soi 12 (Soi Charoenchai), turn into first left (Soi Pridi Banomyong 37.) Al Majis will be on the left.